Conveniently nestled near the beautiful and mysterious Pearl River Delta is China’s third largest city, Guangzhou. Considering that China is the most populous nation on earth, it should be of no surprise that Guangzhou is enormous. The city’s colonial history as a strategic trading port along the South China sea has seen it transform into China’s biggest and busiest transport hub. Located across the bay from the ever popular Hong Kong, a short two-hour train journey away, means that Guangzhou or ‘Canton’ to most visitors is one of the most well-connected cities in China. Twice every year, thousands of importers convene in Guangzhou for the world’s largest trade show, the Canton Fair. With day’s occupied by scanning large halls filled to the brim with manufacturers able to supply you with everything from a range of textiles and fashion items, to automotive parts and supplies, you’ll no doubt work up an appetite at the end of each day. 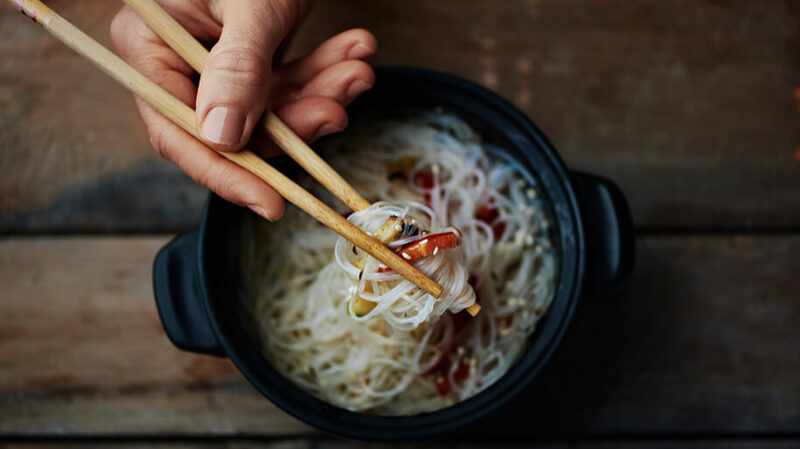 If you’re after something more than a quick and easy takeaway on offer at the fair itself, some of the region’s finest restaurants including the likes of the Panxi Restaurant, Jiang, Wilber’s, La Seine and the Oakroom favoured amongst Canton fair regulars. 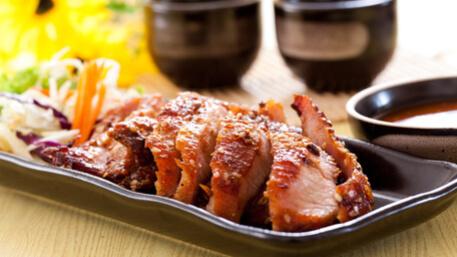 Here are the five best places to eat during the Canton Fair. If it’s your first time visiting the Canton fair, or China as a whole and you’re looking for a quintessential Cantonese restaurant, Panxi is your best bet. 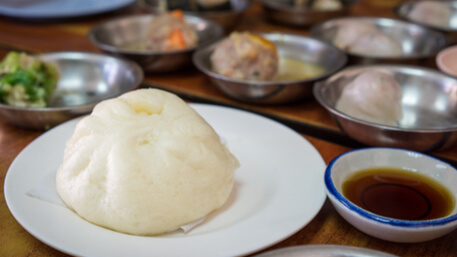 Established in the late 1940’s Panxi is famed throughout Guangzhou for its traditional and affordable dim sum and beautiful Southern Han Dynasty imperial gardens that attract tourists all year round. The restaurant is particularly popular amongst Canton fair visitors, who are looking for the tranquility the restaurant’s setting provides after a long, busy day canvassing the long halls of the fair. Considering how many people visit each edition of the Canton fair, if you’re thinking of paying Panxi a visit, it’s worth making a booking in advance. With meals averaging under $40 per person, it’s no wonder the restaurant is popular amongst locals and business travellers all year around. 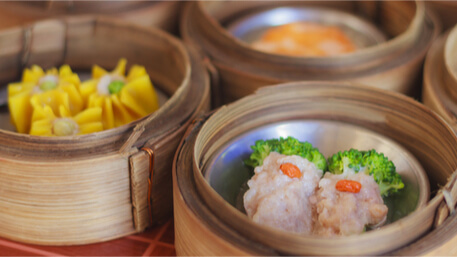 If you’re able to get a booking at Panxi, the Dim Sum might grab the headlines on the menu, but the restaurant is well known for its award winning traditional Cantonese dishes too. If you’re in the mood for an after dinner treat and hoping to take in some more of the sights and sounds of Guangzhou, a walk around the street Panxi is located on, will offer local delicacies such as moon cakes and a seemingly never ending the supply of tea. If you’re staying in the heart of the city, the Mandarin Oriental hotel is one of the best places to stay for the fair. One of the many reasons why is that it’s in house restaurant, Jiang by Chef Fei is at the cutting edge of Chinese cuisine. Lead by the acclaimed and award winning young chef; the menu offers an exciting new take on traditional Cantonese favourites. The ingredients may sound simple at first glance, but the creativity in their assembly is a big reason why Jiang is so popular for business travellers visiting the Canton Fair or Guangzhou itself. The restaurant itself is plushly decorated. If you’re looking for a high-end dining experience, the luxurious interior trims and private dining booths on offer mean you’ll be able to conduct meetings or enjoy some privacy with your partner in comfort. The impressive decor does little to distract from the incredible food, however. 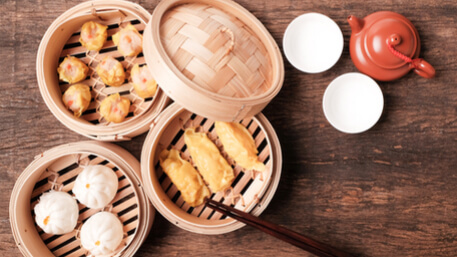 The menu may not be cheap, averaging around $70 for a full course meal, if you’re after a Guangzhou favourite, the Dim Sum is prepared impeccably. The delectable flavours found in the tenderly fried sirloin with Chilli offer something more accustomed to a western palate. The elegance and culinary experience on offer at Jiang are sure to do wonders after a long day experiencing everything on offer at the Canton fair. 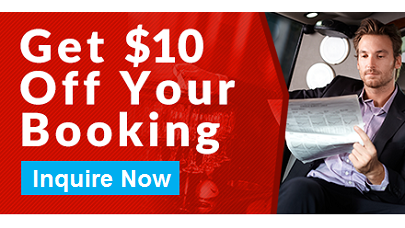 Once you’ve booked your seat for dinner, take advantage of our online discount and book your car ride back to the hotel! If you’re looking for the comforts a taste of home can offer, Wilber’s is considered a staple for Western visitors. Located in a recently restored colonial-era villa, the ground floor offers a popular bar and cocktail era, providing the perfect opportunity to unwind after a long day negotiating with vendors at the fair. The restaurant level upstairs, however, offers some italian favourites and delicacies that won’t go amiss on your trip to visit the fair. For those more daring the squid ink pasta is worth trying, especially if you’re lucky enough to be seated in the leafy, and relaxing patio area or the magnificent rooftop veranda which showcases a great view of the city. For those looking to have their mind made up for them, for just over $50 per person the set menu including the famous mushroom soup and delicious risotto on offer every night always go down well with the locals. It may be far from the romantic avenues of Paris, but La Seine offers visitors the chance to dine on elegant French cuisine, as good as anything you might find along the Champs-Elysee. The interior offers a calming, cosy experience perfect to relax in after a busy day at the fair. The purple and cream colour scheme may stand out amongst other restaurants you visit during the fair, but the colours won’t be the focus of your attention for long when the food arrives. Paired with one of Guangzhou’s best wine lists, the fantastic dishes such as the baked escargot and homemade fois gras, or even the pan fried goose liver with fig red wine sauce gets the approval of guests each day. Despite the elegant, formal approach to their menu, La Seine won’t chase you away if you’ve arrived at the door still in your comfortable jogging shoes that most Canton fair visitors decide to wear considering they’re likely to be on their feet all day. One bonus this restaurant does offer is its proximity to the Xinghai Concert Hall. If theatre or the cultural arts are to your liking, there will be few better ways to unwind than taking in a show at the concert hall before continuing the cultural joys with dinner at La Seine. Considering how popular the restaurant is all year round, with average main course meals only setting you back $20, it’d be best to book your table in advance. If you started in Hong Kong before making your way to Guangzhou and the fair, you’d have hopefully taken in one of the many rooftop views on offer. If you’re after an elegant rooftop view to accompany your meal, the Oakroom is where you’ll want to be. Situated in the heart of the CBD, the Oakroom is on the 16th floor of one of Guangzhou’s most luxurious apartment blocks. The extraordinary views of the city mix perfectly with the restaurant’s elegant, and modern interior design. If your day has been particularly busy, the Oakroom even offers an ‘All You Care To Drink’ special between 7 PM and 9 PM every night. The drinks aren’t the only attraction of one of Guangzhou’s most famous restaurants though. 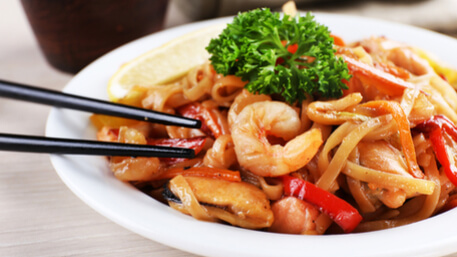 Offering a combination of Chinese and European gastronomy, their menu is sure to offer whatever you’re in the mood for. Some innovative schemes complement the award winning service on offer. Including the bold idea of guests paying only how much they feel the meal was worth. If that doesn’t show you how much confidence the restaurant has in its food, then little will! The Canton Fair is an opportunity not to be missed if you’re importing goods from China. Considering how vast and time consuming the fair can be, any experienced visitor will tell you to do your research on who to meet and where their booth is before entering the fair. The same research can and should be done for your hotel and dining arrangements. The fair is guaranteed to be busy in each edition, after spending all day on your feet the very last thing you’re likely to want to do, is standing in a queue at a fast food outlet or restaurant waiting to get something to eat. Our guide to the best places to eat during the Canton Fair will ensure finding a place to eat is the least of your worries during your stay in Guangzhou! Have you been to the Canton Fair? Do you have any other Canton Fair Tips for business travellers? Share your comments below and make use of our online discount below for your next trip to the Canton Fair!